According to Wikipedia, two of the most popular sports in Thailand are Muay Thai and soccer. I saw both on our first day! Heading into our short, three day stay in Bangkok, my singular goal was to attend a Muay Thai kickboxing match. Although spectators can watch Muay Thai at many places in Bangkok, there are four premier venues. Channel 7 Stadium, where we went, is considered the third or fourth most prestigious, but is unique inasmuch as its matches, held ever Sunday afternoon, are (a) telecast throughout Thailand on Channel 7 and (b) free to attend on a first come, first serve basis. Thus, when Nicole and I arrived an hour before the first fight, the stadium was already packed. Fortunately, there were three rows of benches reserved for foreigners so we still got awesome seats. The fights themselves were a spectacle in the best way possible. Muay Thai is steeped in tradition. Prior to each match, upon entering the ring, each fighter performs his own unique "wai kru ram muay" warm up to honor his home gym and trainers. Then its fight time. Each of the four fights we saw lasted five rounds and, for almost that entire time, the energy in the stadium was electric. Drums beat throughout each fight and the crowd cheered, screamed, and chanted "hway!" in time with each fighter's knee strikes during clinches. Betting is legal and was conducted throughout the fights by bookies using a series of confusing hand gestures. We were seated immediately behind four bookies which added to our fun (we strictly observed, I would have had no idea how to place an actual bet). In short, the Muay Thai turned out to be everything I hoped it would be and more. Later that day, I walked 45 minutes from our hotel to PAT Stadium to watch the home team Port F.C. 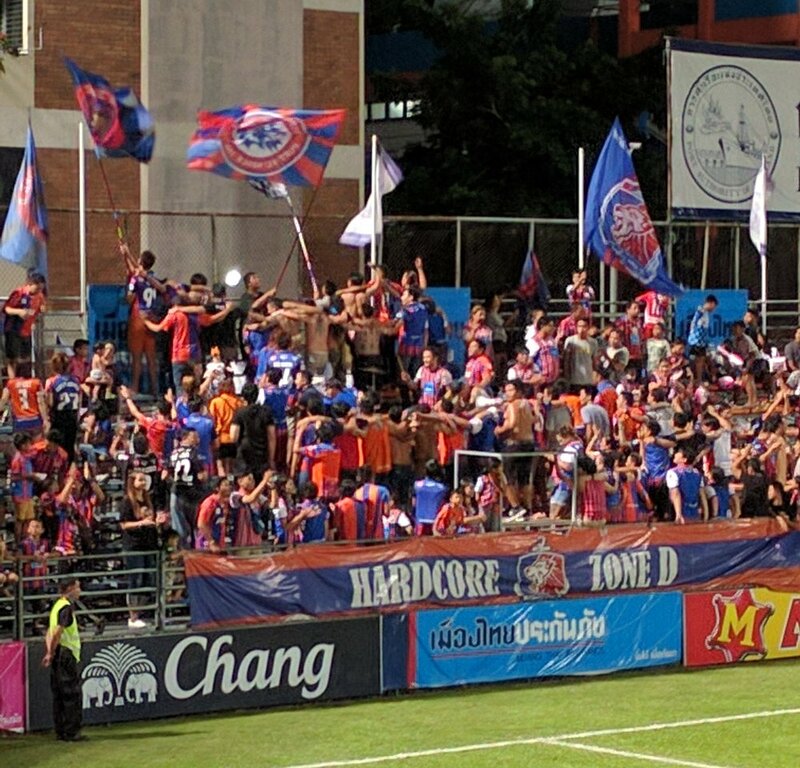 (sponsored by the Port Authority of Thailand) take on Thai Honda F.C. in a Thai League soccer match. For numerous reasons, this turned out to be more great time. Initially, I embarrassed the stadium's ticket takers, who stamp each spectator's wrist prior to entry, by arriving at the stadium so sweaty from my walk that the ink wouldn't penetrate to my skin. After I figured out what was going on, and assured the ticket taker, who was confused as to whether she should try toweling off my arm, that I would do the honors, we got the ink to stick to the amusement of everyone around. Then it was into the stadium. There, my 200 baht ($5) ticket, the most expensive sold, turned out to be too good. Upon finding my chair, in an isolated section consisting almost entirely of foreigners, I walked over and joined the masses of locals on the general admission benches. Although I was initially too timid to join the majority of spectators who stood throughout the match, after five minutes one of the locals saw my enthusiasm for the home team and, despite speaking no English, motioned me over to stand with everyone else. So I stood for the entire first half and cheered my head off. Last, the scene outside the stadium was just as fun as inside. Kids played pickup soccer on a practice field while adults ate and drank at the nearby vendor booths. I noticed everyone drinking an iced, light brown liquid from large, clear plastic cups. Because it was sweltering, I assumed it was iced tea and thought, that sounds great. When I realized it was beer, I thought, even better! In the final analysis, we had a great time in Bangkok for more reasons than just the sports. We ate excellent pad thai, visited the Chatuchak weekend market with its 15,000 booths, and had a drink fifty-nine stories above the city at the famous "Vertigo" bar of the Banyan Tree Hotel where we stayed. Nonetheless, I will remember Bangkok most for its sports!